Melissa Dohme, set to toss the ceremonial first pitch at Monday's Tampa Bay Rays game, was the night's star attraction -- but not for throwing a baseball. Dohme has made a remarkable recovery after a horrendous attack three years ago, when she was stabbed 32 times by a former boyfriend. The EMT who responded to the 911 call remarked that she was so drenched in blood, "you couldn't tell she was blond." The first responders helped save Dohme's life. After spending three weeks in the hospital, she later graduated from St. Petersburg College-Clearwater, and today works as an advocate at Hands Across the Bay to help victims of domestic violence. Hers was a horrifying and inspirational story which she described for "48 Hours: Live to Tell," in an episode titled, "One Last Hug." But merely throwing out a baseball Monday wasn't the highpoint of Dohme's night, when the man in a blue jacket ran up from behind home plate to present her with a ball on which was written: "Will you marry me?" That man was the paramedic who had saved her life. 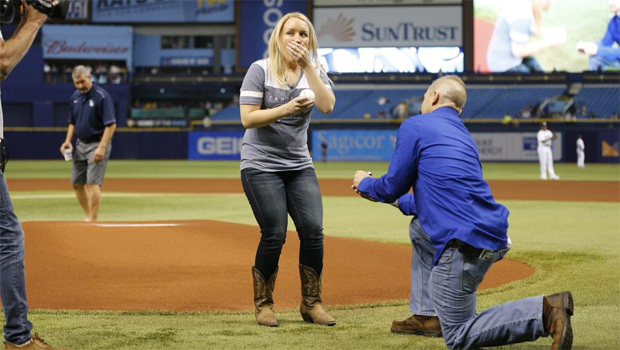 The Tampa Bay Times reports that Cameron Hill, the first responder who arrived at the scene of the attack in Clearwater, Fla., in January 2012, got down on one knee at home plate Monday before 10,000 baseball fans to ask for Dohme's hand. Several months after the stabbing attack, the two had met again. Dohme told the Tampa Bay Times that, while she was at first unsure about a relationship, they eventually began dating. "He's the one I've been waiting for. My fairy tale," she told the paper in 2013.